At Ayers Basement Systems, our solution to block foundation walls in a crawl space is the WallCap Block Wall System. This plastic covering seals off the top of your block wall, keeping humidity out. And because it's clear, your walls will still be visible for termite and pest inspectors. The installation can be done by one contractor while the rest of your CleanSpace® system is being installed by the rest of the crew. A complete CleanSpace® installation usually takes less than a day. 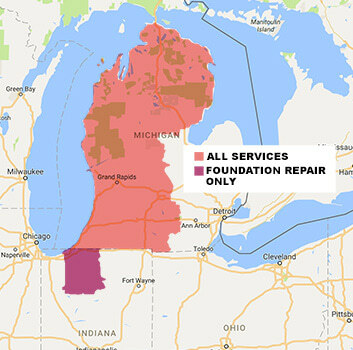 We service Big Rapids, Grand Haven, Coldwater, Ionia, Charlotte, Ludington, Cadillac and many nearby areas in Michigan & Indiana.